He called for further British proposals on how to avoid a hard border in Northern Ireland, which he calls a “European issue” not just an “Irish issue”. As regular readers of this COGwriter Church of God News page are aware, I have long warned that the Europeans would turn against the British. There are issues that Northern Ireland and Gibraltar are facing because of the Brexit vote. Residents of both of those locations voted against the Brexit and for staying in the European Union. Now, both territories are facing challenges. But they both want to remain part of the UK. Despite what many think today, Northern Ireland will one day become part of the European Beast power, and it is likely that Ireland, officially currently the Republic of Ireland, will assist in the governance of it. For many years, the major sea gates of the world were possessed/controlled by the United States (Panama Canal and certain locations in the Pacific ocean) and the British Empire (Straits of Malacca, Singapore, Suez Canal, Bab el Mandeb, Strait of Hormuz, Simon’s Town/Cape of Good Hope, etc.). And while that is no longer the case for many of them, they seem to have been prophesied to be taken away for disobedience as well (cf. Deuteronomy 28)—and certainly these nations have disobeyed the God of Abraham, as well as actually lost many of those gates. Thus, it seems logical to conclude that the remaining “sea gates” that the UK has such as Gibraltar and the Falkland Islands will be separated from UK control. Spain will directly, or perhaps indirectly, through the EU (or some other European confederation), force out British control over Gibraltar. As far as the Brexit goes, a poll concluded: Support for Brexit hits a five-month high, with 55 per cent of UK population now backing exit from European Union. 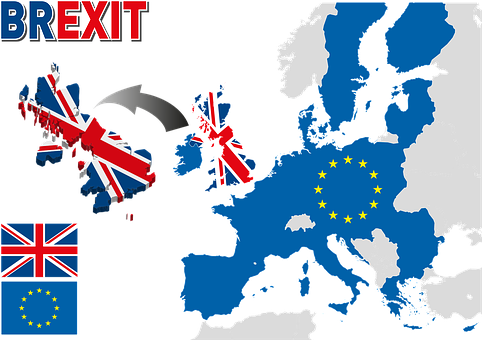 With what has been going on in the UK, the EU, and the USA since the Brexit vote, more in the UK are concluding that they are desirous of leaving the EU. The EU has taken several stances that the UK does not like, including stances that the EU used to pretend it did not really have. Glimpses of the true colors of the European project (e.g. Daniel 2:41-43; Isaiah 10:5-8) have re-assured some in the UK that leaving the EU is in its best interest. The final European Beast power will destroy the UK. 8 Israel is swallowed up; Now they are among the Gentiles Like a vessel in which is no pleasure. 9 For they have gone up to Assyria, Like a wild donkey alone by itself; Ephraim has hired lovers (Hosea 8:8-9). Prophecies like the above indicate that the British will try to make some deal with the Europeans after their nation is taken over. Since I tend to believe that these verses in Hosea will be fulfilled after the start of the Great Tribulation and before the return of Jesus Christ and the establishment of the Kingdom of God, that suggests some ‘regrets’ from the UK. Jean-Claude Juncker’s statement that the time will come when the UK ‘will regret your decision’ is consistent with what will happen to the UK. This entry was posted on Tuesday, March 13th, 2018 at 2:00 pm	and is filed under Prophecy.